The waterfront of the town of L'Anse aux Meadows in Newfoundland, Canada is adorned by fishing stage buildings and small fishing boats. A brightly paiinted fishing stage sits along the waterfront in the town of L'Anse aux Meadows in Newfoundland Labrador with a small fishing boat docked in front. This building is similar to the many that line the waterfront of this small fishing town which carries a lot of history bringing visitors to Newfoundland to explore. 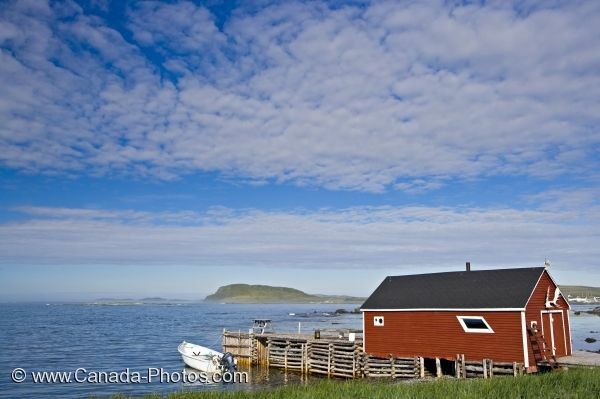 A red fishing stage in the town of L'Anse aux Meadows, Northern Peninsula, Great Northern Peninsula, Viking Trail, Trails to the Vikings, Newfoundland, Newfoundland Labrador, Canada. Picture of a building housing a fishing stage along the waterfront of the town of L'Anse aux Meadows in Newfoundland.